Did you know … that the most goals scored in a single World Cup tournament is 13? … that a substitute player, who just came into the game to spell a regular, managed to write himself into World Cup history by scoring a hat-trick? … that the most controversial goal in the tournament’s history was scored by a British player while the Queen of England was in attendance – and the game official must have been shaking in his boots, fearing he might blow the call? 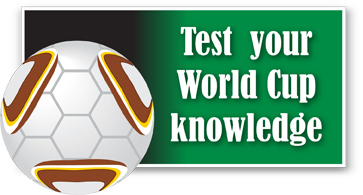 These and a few other notable World Cup facts are in this interactive quiz. Take the quiz and play on! It was rather interesting for me to read the post. Thanx for it. I like such themes and anything connected to them. I definitely want to read more on this site soon.